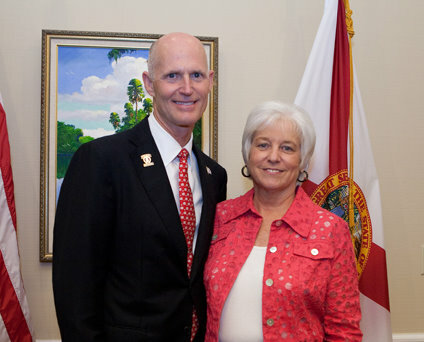 Thank you to Florida's First Lady for her continued support. 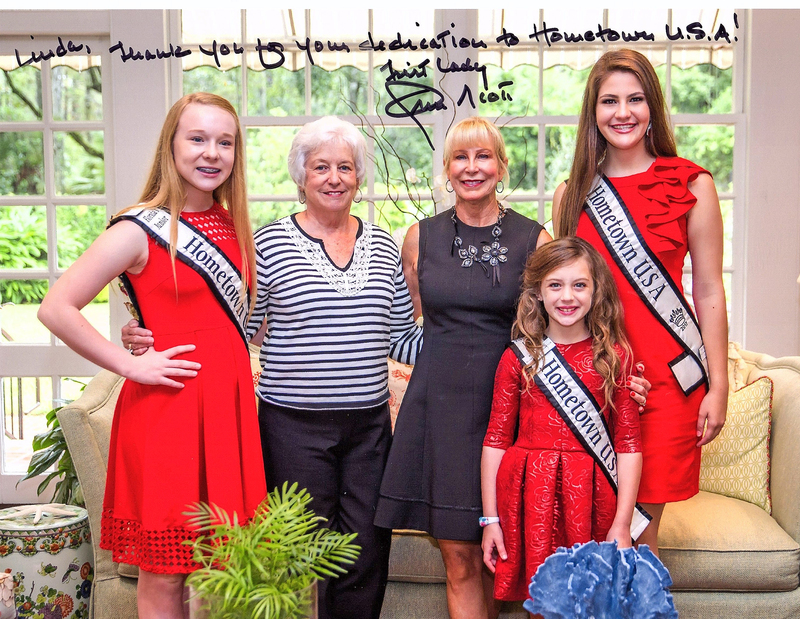 Thank you to Mrs. Scott, Florida's First Lady for your support! 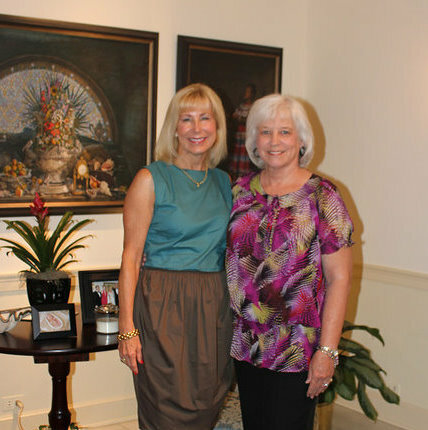 Linda with her friend, Ann Scott at the Governor's Mansion in October 2014. 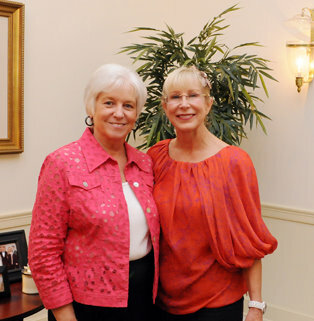 Linda with Florida's First Lady Mrs. Scott and Governor Scott on a recent visit to Tallahassee. 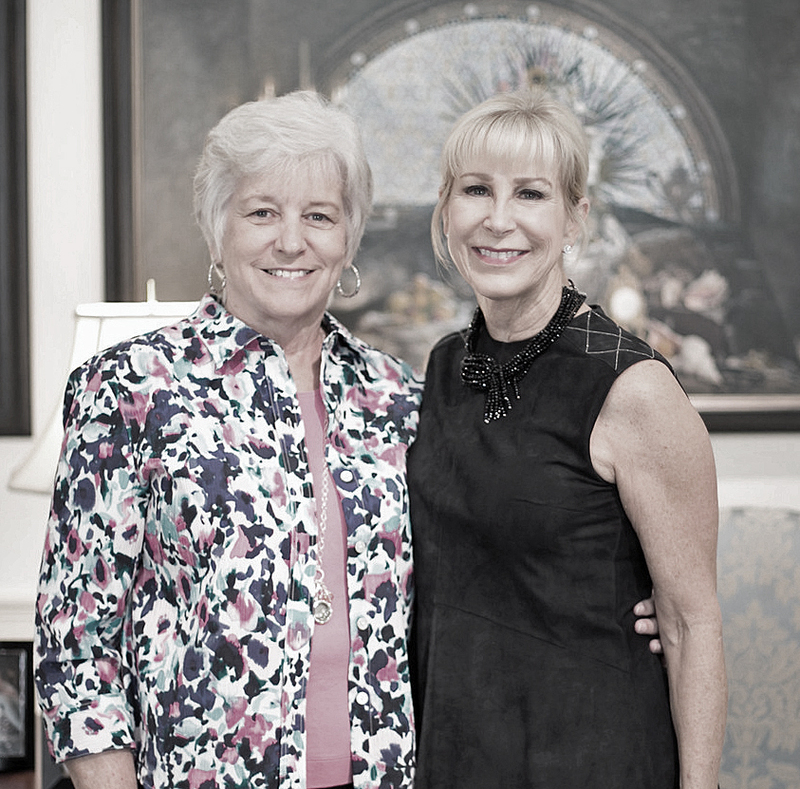 Linda Watts has always had an innate sense for helping others. Her unstoppable spirit led her to develop a grassroots youth program in 1986, focusing on linking youth with volunteer activities in their communities. 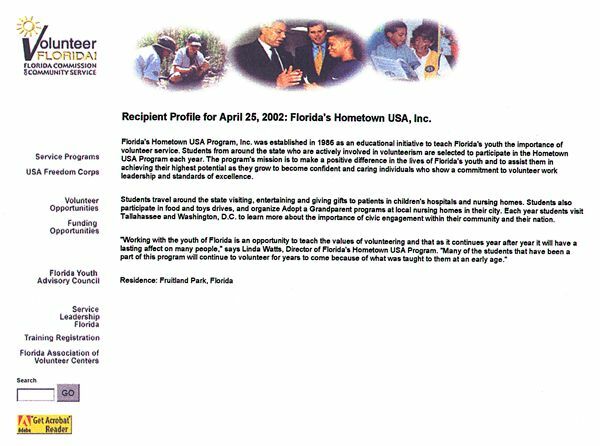 Today, Florida's Hometown USA Program, Inc. is a successful non profit organization that inspires young people to better the lives of their neighbors through volunteering. 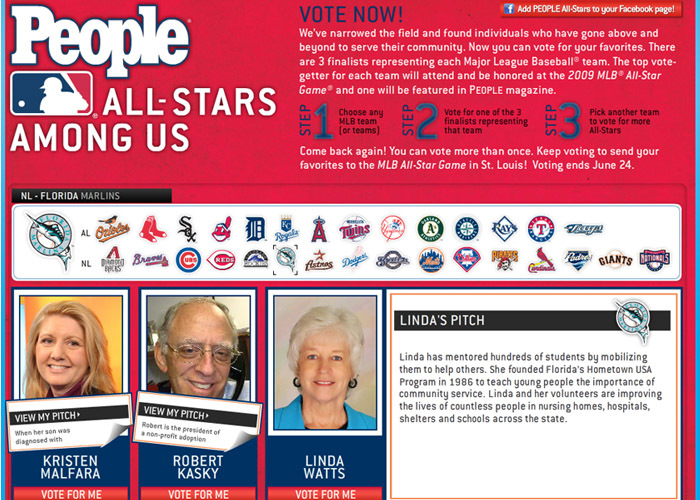 Linda was selected as one of 100 semifinalist from throughout the United States for the Energizer Keep Going Hall of Fame Award. Orlando Sentinel - March 16, 2011 Linda Watts of Leesburg, FL has been named a semifinalist to become the 2011 inductee into the Energizer Keep Going Hall of Fame for her work as founder of Florida's Hometown USA Program, Inc., which has encouraged hundreds of Florida students to do volunteer work since 1986. This award honors people who make a difference in their community. Thank you, Jim and Leesburg Wal-Mart for your support. 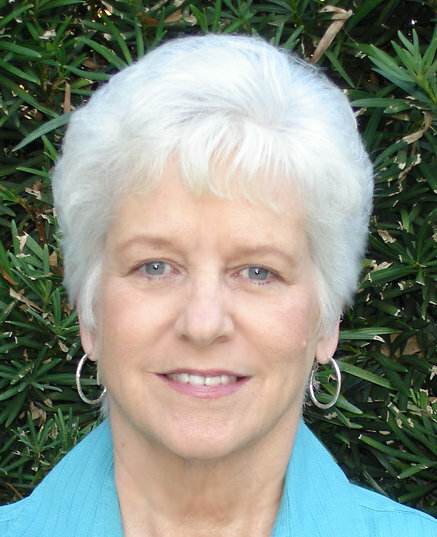 (April 20, 2010)- Linda Watts, of Leesburg, FL has been named a University of Phoenix Volunteer Leader Award Honoree, an award given by HandsOn Network and the University of Phoenix to 10 outstanding volunteer leaders in the nation. These leaders motivate others and are catalysts for change in their communities. The award celebrates the first anniversary of the landmark Edward M. Kennedy Serve America Act, which authorized the largest expansion of national service in America in decades. Watts received ten thousand dollars to donate to the organization of her choice - Florida’s Hometown USA Program, Inc.
Watts, a retired teacher, had a vision to develop a grassroots youth program that focused on linking youth with volunteer activities in their communities. In 1986, she founded Florida’s Hometown USA Program, Inc, a nonprofit educational endeavor to inspire young people to better the lives of their neighbors through volunteering. Today that vision has grown into a broad model that continues to make a difference in the lives of children and youth. Watts encourages those involved in the program to believe in their power to change communities positively and measurably. Over the years, she has worked with hundreds of students who give their time to help others, and she continues to develop the next generation of volunteer leaders. Most important, these students go on to create their own volunteer programs and engage others in service. By celebrating these inspirational leaders, the University of Phoenix and HandsOn Network hope that others will be motivated to serve in their communities. "We are proud to honor each of these outstanding individuals and excited to see what they will continue to accomplish as volunteer leaders in their communities," said Bill Pepicello, president, University of Phoenix. "By celebrating these inspirational leaders, University of Phoenix and HandsOn Network hope that others will be motivated to serve in their communities." 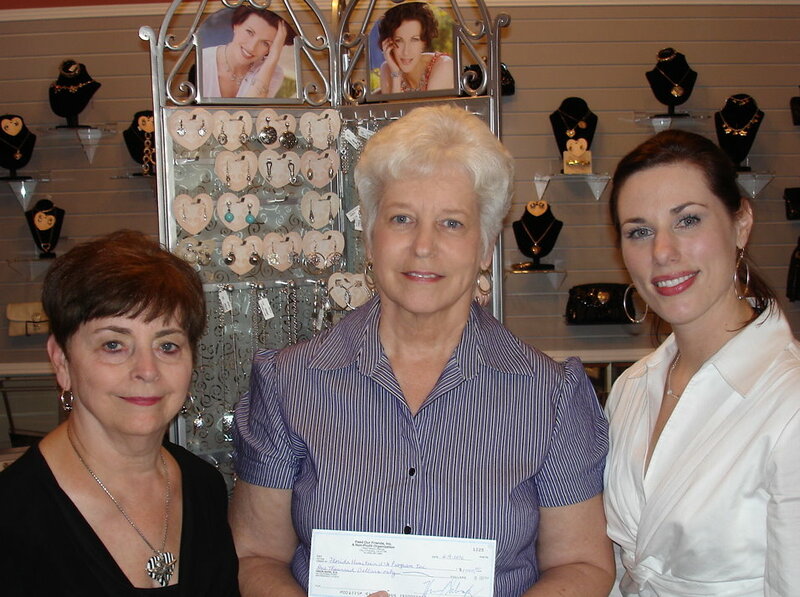 Florida's Hometown USA Program received one thousand dollars from Brighton Jewelry's Feed Our Friends promotion. Non profit organizations were selected from across the United States that are helping provide food for the needy. Shown presenting the check to Linda Watts is Dell Ross of Doggibags, local Brighton store and Megan Greenwood, Brighton Regional Manager. 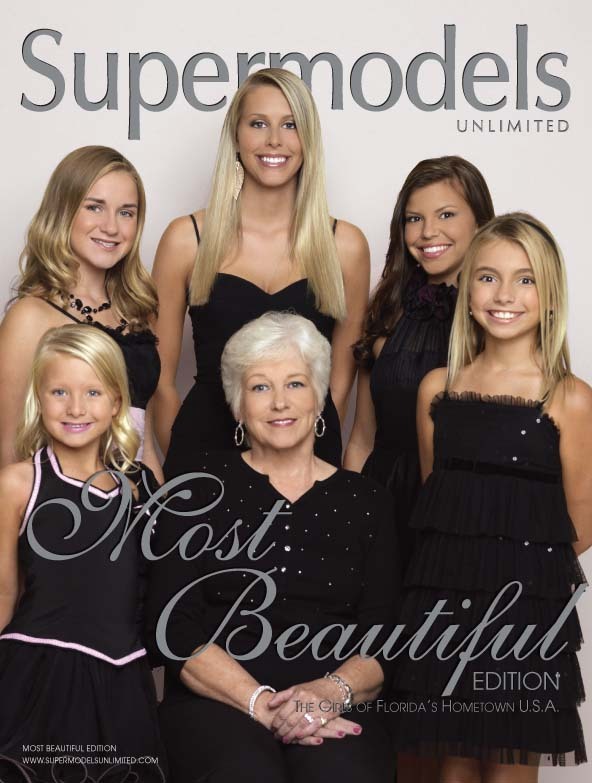 Florida's Hometown USA Program was selected for the cover of Supermodels Unlimited Magazine's 2009 Most Beautiful Issue. This is a great honor and we are very happy to have been chosen! We also received two pages of coverage inside the magazine. Thank you, Kim, for your kindness! Our photo shoot in NYC was a very fun and exciting time for all. 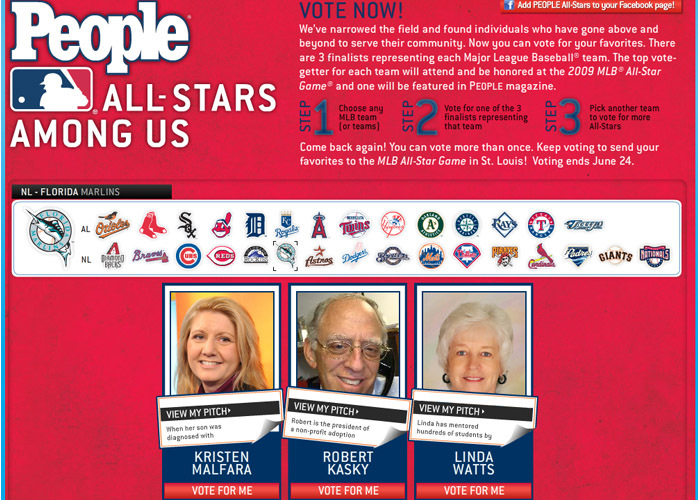 Linda Watts was chosen by People Magazine as a People MLB ALL-STARS AMONG US. This honor recognized individuals who have gone above and beyond to serve their community. Linda has mentored hundred of students by mobilizing them to help others. She founded Florida's Hometown USA Program in 1986 to teach young people the importance of community service. Linda and her volunteers are improving the lives of countless people in nurisng homes, hospitals, shelters and schools across the state. 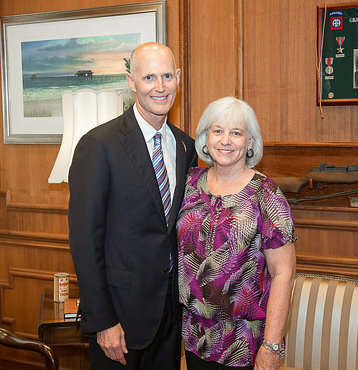 Linda Watts and Governor Charlie Crist at the Point of Light Reception at the Governor's Mansion in Tallahassee. 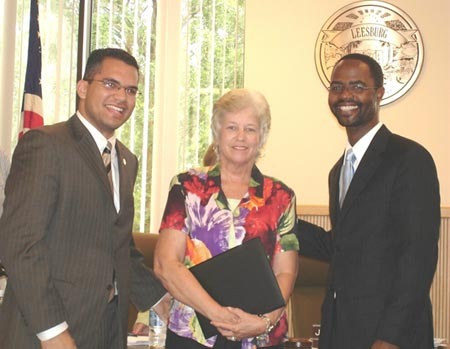 The award was presented to Linda by Emmanuel Tormes, Special Assistant to the Governor and Mayor John Christian, City of Leesburg. 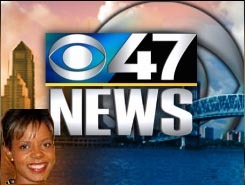 Linda Watts, founder of Florida's Hometown U.S.A. Program was named a Governor's Point of Light for her volunteer work in the community and statewide. Watts, a retired kindergarten teacher founded Florida's Hometown U.S.A. in 1986.The program soon expanded across the state, with hundreds of students working through the program since its inception. She fields many requests each day from statewide volunteers for work or opportunities through the program. It is a way to introduce students to volunteerism and help bring a bit of joy to retirees and nursing home residents. It is also a way to educate students of the importance of community involvement, she said. 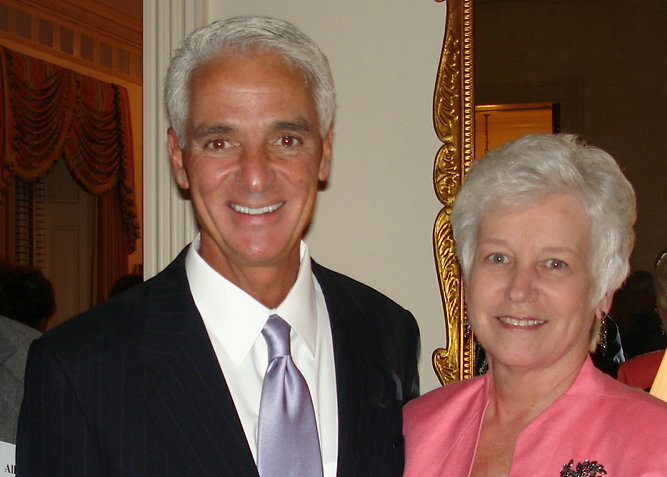 "Linda is helping to shape Florida's future by investing in our most precious resource -- our children" Governor Crist said in the press release. "Her enthusiasm and hard work have helped many students reach their full potential." Governor's Point of Light for outstanding volunteerism to Linda Watts to be presented by Emmanuel Tormes, Special Assistant to Governor Christ, and Mayor John Christian. Stephanie at her TV interview. Denise Douglas, TV 47 reporter. Florida's Hometown USA is made up of students from around the state. They travel in small groups to hospitals, nursing homes, youth homes and other places to volunteer. They carry donations and spend time with those who need it. The kids range in age from 4 to 19. Some of them made a stop in Jacksonville hoping to put smiles on the faces of people at Wolfson Children's Hospital, The Pace Center and Taylor Home for the Elderly. The group is always looking for volunteers. Anyone interested can call (352) 326-4217 for more information. 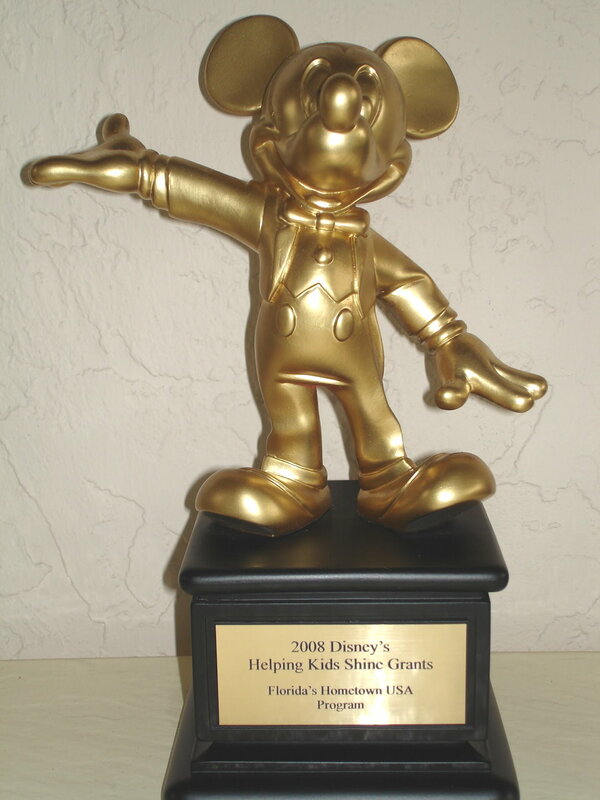 Florida’s Hometown USA Program, Inc. was selected to receive a 2008 Disney’s Helping Kids Shine grant. Florida’s Hometown USA Program. Inc. (founded in 1986) is a non-profit educational youth organization that reaches beyond the borders of its own hometown of Leesburg, FL to nurture and inspire a volunteer spirit within youth across Florida. Twenty two years ago, a local educator had a vision and developed a grassroots, community youth program that focused on linking youth with volunteer activities. Today that vision has grown into a broad model that continues to make a difference in the lives of children and youth of Florida, primarily through a professionally supported volunteer program aimed at assisting students to achieve their highest potential. The focus of their volunteer work is with children, youth and the elderly offering support to the needy and to those who have been abused or neglected. The ""Disney's Helping Kids Shine" grants focused on groups in Orange, Osceola, Lake, Seminole and Polk counties that build better futures for children. The grants were awarded on May 23, 2008 at a ceremony at the Osceola County School for the Performing Arts. "As a company with more than 62,000 cast members, we are always looking for new ways to invest in our community so that Central Florida becomes an even better place to live, work and play," said Eugene Campbell, vice president of community relations and minority business development for Walt Disney World Resort. Walt Disney World awarded grants to 44 Central Florida non-profit groups. Disney’s Helping Kids Shine Grants is the premier charitable giving program for Walt Disney World Co. and provides funding for organizations that focus on four specific ways of helping children: connecting with adults, constructive use of free time, character development, and compassion. 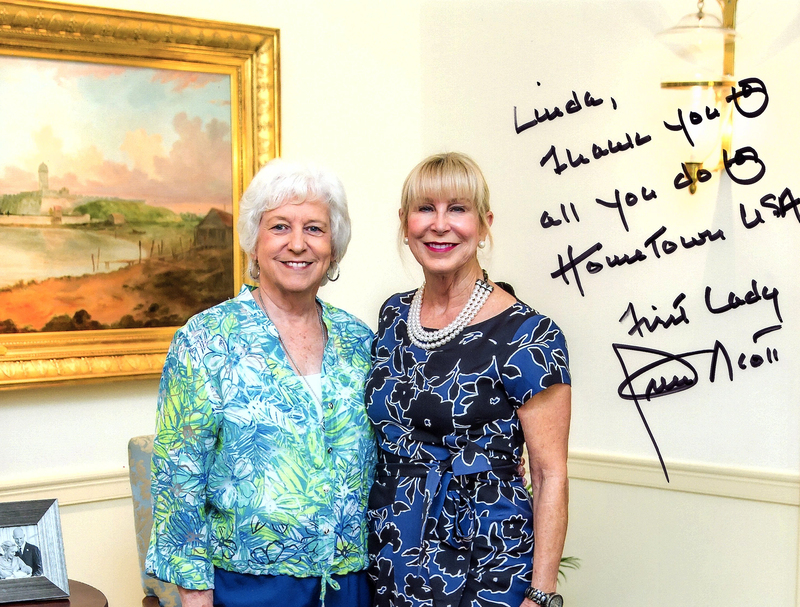 Hometown Heroes is a program designed to honor the unrecognized citizens who enrich communities across Central Florida with their dedication to volunteer service. This program recognizes Florida citizens who have distinguished themselves in volunteer humanitarian service, service over a long period of time, service to the disadvantaged and underprivileged, to children and/or the elderly, the sick and needy, service requiring an unusual amount of time and/or effort and service that directly or indirectly benefits the whole community.